To the casual observer, which includes most of humanity, what is going on the Mid-East and North Africa, specifically Egypt and Syria at this time, seems random and chaotic, but in reality this is not the case at all - events are unfolding according to a Grand Plan. Before anyone writes in to advise me that the above map is old, and does not show South Sudan, I am aware of this but could not quickly find a better map. I would point out that my geographical knowledge is actually better than a past President of the United States, Jimmy Carter, who when told during his presidency in the 70's that a conflict had broken out between Chad, a north African state, and one of its neighbours, responded "Chad! - where the hell's that??" The instigators of the Grand Plan are the "Axis Powers" - Great Britain, Israel, and the US, which for brevity we will hereafter refer to simply as "The Axis". Note here that this term is not used in any judgmental way - it refers to an alignment and union with common objectives. Within the Axis, Israel is the dominant and controlling force - as Ariel Sharon sagely observed in the Knesset years ago - "Don't worry - we control America". Israel's interests and objectives are paramount, which means, in effect, that the US military is a tool for it to use as it wishes. It also helps to explain why such a huge slice of the US GDP is channeled into the defense industry. Within the Axis, Great Britain serves as the "sidekick"; its main function is to give a veneer of credibility to successive military operations, as it looks a lot better if the force attacking say Libya can be described as a "coalition", rather than just the US on its own. 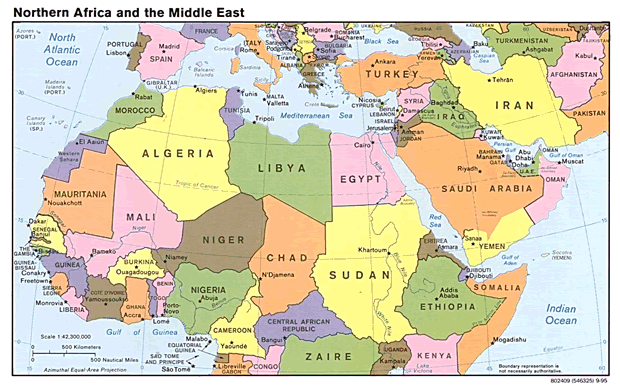 There are 2 main planks to the Axis' Grand Plan - one is to neuter any potential enemies of Israel, which includes all Arab states that are not client states of the Axis, like the bought off Saudi regime, and the other is to maintain the petro-dollar system, which enables the US to maintain economic and military dominance of the planet by swapping intrinsically worthless paper - dollars and Treasuries - for goods and services. In addition, the progressive colonial style rolling conquest of the Mid-East will enable the Axis to exploit the region's rich oil reserves on its own terms. An interesting point to note is that, within the Axis countries themselves, ordinary citizens, whose limited thought processes are largely controlled by the media, have no idea that this Grand Plan exists. Those Arab leaders who tried to uncouple from the petrodollar system and go it alone by selling their oil in, say, Euros paid a heavy price and are not around anymore. Saddam Hussein of Iraq planned to do it and instead ended up swinging from a rope. Colonel Gaddafi of Libya tried it too and came to a grisly end. When the Axis decides it wants to bring down a state that is either belligerent towards Israel or is threatening to go off the petrodollar, it foments revolution in the country concerned by supporting dissident factions and sending in mercenaries etc, with the aim of creating a civil war and toppling the government, and if that doesn't work it invents a story like the infamous "weapons of mass destruction" story about Iraq and manufactures "false flag" incidents and then flat out invades, using that as an excuse. The "Big Daddy" of false flag incidents was staged on home soil in New York on September 11th 2001 and at the Pentagon itself, which provided the excuse to invade Afghanistan and Iraq. To many Americans this event was more significant than the 2nd World War, when the reality is that just a handful of big buildings were destroyed or damaged. We can see a combination of these two tactics at work right now in Syria, the country has been largely destroyed by an Axis fomented civil war, and now we are seeing the end game with the false flag event of the gas attack providing the excuse to "finish the job" with cruise missiles etc, which will largely be used to wreck the countries' infrastructure by destroying bridges and power stations etc, and whatever military capability it has left. This will leave it as a failed state which will no longer be any threat to Israel and can be completely controlled by the Axis. The "Arab Spring", a term contrived by the Axis propaganda machine, implies that there is almost a horticultural freshness to the process of neutering and balkanizing various Arab states in accordance with the Grand Plan. After Syria, there is just one large ripe fruit waiting to fall into the Axis basket, and that is Iran. Once Iran falls, the Axis will have achieved complete suzerainty over the entire region, something that it has been working tirelessly for many decades to achieve. A big, big problem for the Axis is that because the US has abused the paper for goods and services trade to such an extraordinary degree in recent years, by continually raising the debt ceiling and QE pumping etc, foreigners have become sick and tired of accumulating destined to be worthless dollars and Treasuries and have started to dump the latter by the boatload, and while you may be able to force foreigners to stick with the petrodollar system at the point of a gun, you can't force them to buy (or not to sell) Treasuries by this means. This threatens to drive an unprecedented interest rate spike that will implode the debt-wracked US economy. What this means is that the Axis military machine, which is in effect paid for by the rest of the world, could eventually grind to a halt for lack of funding, hence the sense of urgency with respect to finishing the job in Syria and then Iran. Right now the funding shortfall is being pushed onto the American lower and middle class who are being impoverished by a combination of stagnant incomes and strong inflation, which is understated by government statistics. While the Axis are getting very close to achieving their dream of complete dominance of the Mid-East, which will be ruled over as a sort of fiefdom, there is one big danger that right now is very acute. There are other power blocs in the world who are strongly opposed to Axis plans, principally Russia and China, and who happen to have nuclear weapons. Russia views Syria as an ally and has said that an Axis invasion or attack will be seen as "crossing the red line". So it seems that Barack Obama is set to call Russia's bluff over this. We had better hope that Russia backs down and yields to the will of the Axis, because if it doesn't we could be moving in the direction of a World War. If you think that people couldn't be that stupid, just look what happened leading into World War 1 and World War 2. Technology may have made enormous strides since then, but human nature remains essentially the same - with politicians (many, but not all) still driven by ego, greed and the lust for power that has caused the deaths of millions in the past, and could easily do in the future. Looking on the bright side, with about 8 billion people in the world (and only about 3,000 tigers), we could certainly do with a cull. If the strikes are called off at the last minute, which looks unlikely, the pressure to degrade Syria will continue, before more attention is directed at Iran. Great economic cycles and war cycles are related. The breeding ground for Nazism was economic depression and extreme privation in Germany in the time preceding Hitler's rise to power. The 2nd World War followed on after The Great Depression etc. Someone recently produced a long-term war cycle chart (I think it was Weiss Research) showing a major war cycle peak in 2019. © 2013 Clive Maund - The above represents the opinion and analysis of Mr. Maund, based on data available to him, at the time of writing. Mr. Maunds opinions are his own, and are not a recommendation or an offer to buy or sell securities. No responsibility can be accepted for losses that may result as a consequence of trading on the basis of this analysis.